Skol Lager advert from 1983. 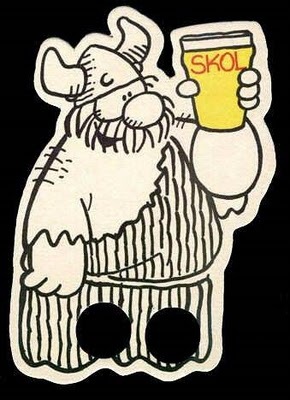 Skol is an international beer brand. Allied Breweries of the UK, Labatt of Canada, Pripps-Bryggerierna of Sweden and Unibra of Belgium formed a new company called Skol International in 1964. Its aim was the creation of a world-wide beer brand, Skol lager, which could be licensed, manufactured and marketed across the world. Since then participation in the company has changed. Skol is the most popular beer in Brazil, originally produced by Caracu, which was bought by Brahma in 1980, which in turn became Ambev, then InBev and later AB InBev. Carlsberg holds the license outside Africa and South America. Unibra holds the license for Africa. The name is related to the Scandinavian toast “skål”. For a period, the Hagar the Horrible cartoon character was used for promotion. The merger between Allied Breweries and Carslberg, created Carlsberg-Tetley’s, who now brew the beer at their brewery in Leeds.